An Oldie but a Goodie – WFMW from the Past! Being a homeschooling mom is all about the perks – cool office supplies, 1000′s of great books (right there on your very own bookshelves), flexible hours, frequent snack breaks, and, of course, the generous pay. But the main draw is really the office supplies. Most homeschooling moms I’ve met have what approaches an obsession with Sharpies, notebooks, binders. Don’t even get them started on their printer/copy machine or the best type of #2 pencils (which they buy in bulk). 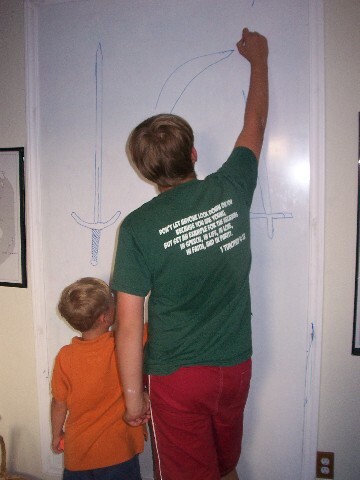 Every homeschooling family neesd a HUGE, full-size whiteboard. 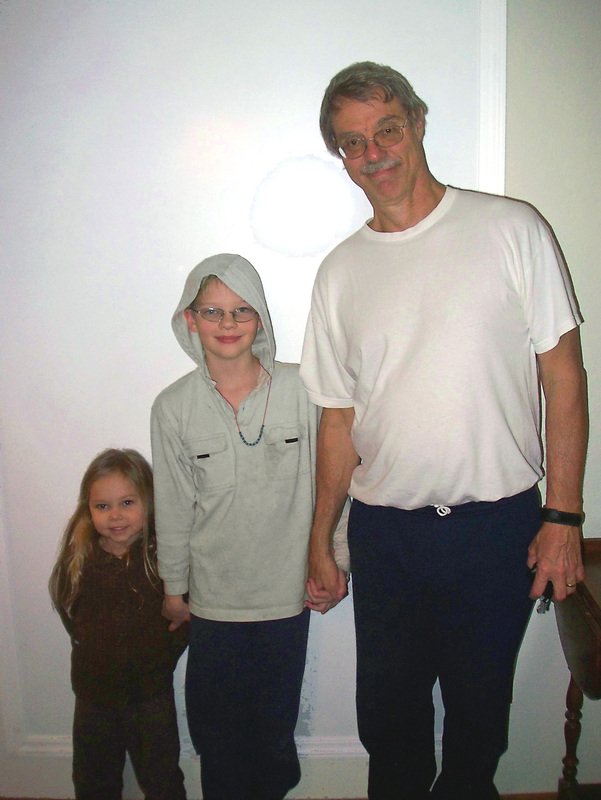 In my desire to organize and outfit one of my homeschooling rooms, I searched for a large bulletin board and whiteboard. My investigation led to expensive school supply companies, with glossy brochures and slick ads, but nothing within my budget. One day a friend casually mentioned working math problems on her large whiteboard. My ears immediately perked up. It turned out she had a six foot whiteboard in her school room. “What? 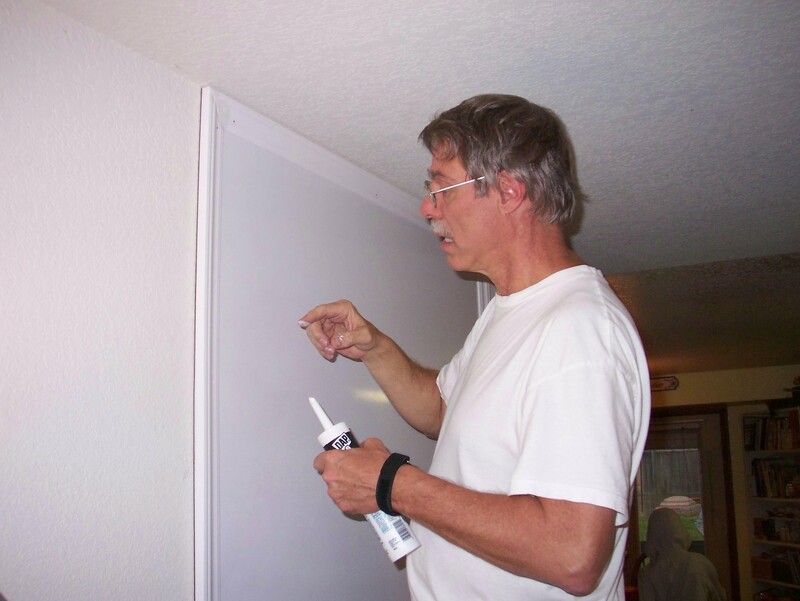 !” I had never heard of a homemade whiteboard much less a six foot one. Doing things on a large scale is just my sort of thing. For example, why buy one bookshelf when you can go to IKEA and pick up seven. Hypothetically speaking, of course. A floor to ceiling whiteboard went right to the top of my Honey Do list. The instructions were incredibly easy and CHEAP! I couldn’t believe I hadn’t heard of this before. 1) Go to Home Depot or Lowes and buy a 4 x 8 sheet of whiteboard ($13 to $15). It’s called solid white tileboard (Melamine tile wall panel) used as a tile substitute in bathrooms, sometimes known as showerboard. 2) Measure and cut to appropriate size. I wanted one that went the full height of the wall so we cut off only a portion on the top, resulting in a 4 x 7 whiteboard. 3) Attach to the wall. Some instructions say to use panel adhesive to glue it to the wall (this would help to prevent buckling). We didn’t take this approach, deciding instead to screw it into the wall at regular intervals (into studs where possible). My father in law visited while Tim was in the middle of installation and graciously helped. 4) Frame new whiteboard with molding. We decided to use the plastic white molding (didn’t want to deal with painting or staining). My dad was in town and offered to help. Really, Tim and I outsourced almost this entire project. That, of course, is a whole ‘nother Works for Me Wednesday tip. Daniel helped Grandad put up the molding. Sarah joined the picture to add some beauty. There you have it. 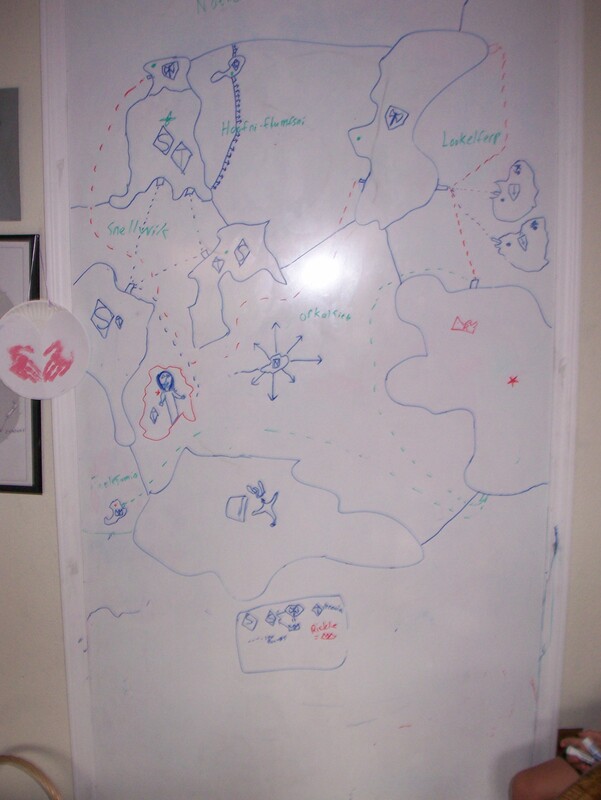 An affordable GIANT whiteboard. We use it for everything – notes to each other, elaborate maps of imaginary lands, math problems, spelling words, grocery lists, camping/packing reminders, and of course, stick figures. Not to mention the boys’ future plans for an armory out back. 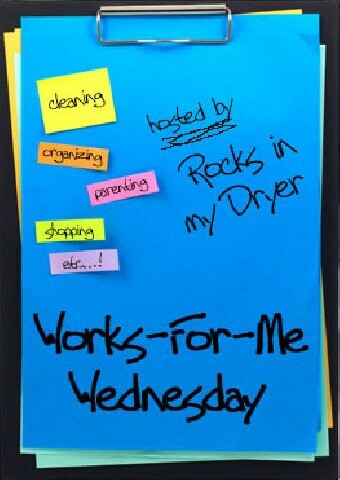 Head over to Rocks In My Dryer for other great Works for Me Wednesday links. That was such a great idea!! I hope you are linking this to every HSing site you visit, it’s such a time and space saver! Jennifer, what are you doing up so late? Blogging yourself, I see. The frame completely transforms the whiteboard to being a handy tool to being attractive. I’m crazy about mine and would put one up in all the kids rooms if I could only get my father (and father in law) to come over and help. Great tip! I know lots of teachers that use the whiteboard from Home Depot to make mini white boards, as well. A cheap way to give every student a white board. Question- do you erase it daily to add new stuff? Does it erase clean or always look a bit worn out? We just picked up any stray model magic bits by hand. Yes, it comes with ideas. This is a great idea! Our new house has a finshed basement where this would be perfect. Thanks for passing along such a wonderful tip!! Hi there! Just wanted to let you know that it’s PARTY TIME over at my blog! Swing by and check it out!!! Ok, this beats all! The smell of sharpies does make me dizzy with pleasure. And at this very minute, I’m planning where I’m going to put my new giant white board. Maybe next to the game boards on my wall! This is a great idea, even if you don’t homeschool!! Thanks for sharing! That’s a great idea. I always forget that we can make stuff ourselves — I need to spend more time in the hardware store to get inspiration! Thanks for the good idea and for stopping by my blog. Kathy, I remember reading your entry when you first put this up. It is a terrific idea. Thanks for sharing the instructions! I remember seeing the first post about this when you had first installed it. I was so jealous! I have almost no wall space so it will have to wait until I get my school room – some day. Way too cool! I get together with a friend who has one that takes up almost an entire wall in her living room. It’s always covered with notes & reminders. It does really work very well. Great idea! Thanks for sharing. Outsourcing is GOOD when it saves you time! Isn’t it nice to have grandpas to help. Yes, having the wall space is important. Usually my rooms are full of bookshelves but I have this one wall in the dining room that is empty. It’s part of the hall way so I can’t put anything much on it or it impedes traffic. It’s the perfect place, however, for our big map, bulletin board and whiteboard. Now to be careful not to mix the dry erase markers with the Sharpies! The board cleans up great. We use an eraser with it most of the time. If there is a lot of residue on the surface we use a wipe or wet paper towel to clean it more thoroughly. I would imagine it will need to be replaced at some time. Cool and easy… how is the erasing after a few weeks? It is always a fight to find the ultimate ceramic steel / marker combo. I do know that it is not the same but we have designed wall panels that need zero installation and deliver a big sketchestate and also store your markers neatly in the side. They are made for offices and the pricing is not DIY level but the advantage is that you can move it around once in a while and that it is modular..
I’m curious about the white plastic molding. I’ve been wanting to use the whiteboards at our church, but I haven’t found any molding that is cut out to fit flush against the wall and against the whiteboard. I’d love to know how you solved that problem. What abou the molding? Where did you get some that would fit well against both the wall and the whiteboard?